I don't have many collections of pricey items, but I do like the look of groupings of similar objects. So, when I noticed that I had these similar candle holders on hand, I decided to make a grouping with them on the chest in my foyer. 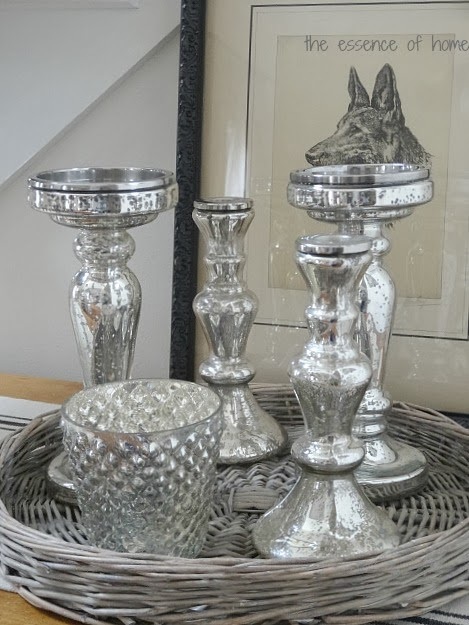 These candle holders are made to look like mercury glass, but I'm sure they are not. I have a few more of these, but I wanted them to fit in this wicker round tray. So, I just used these five. I like how the lamp light makes them shine too. Do you like to use groupings of similar objects in your home? That looks very pretty Kelly...I love how they look displayed in the round basket rather then just being placed on top of the chest. I think placing them in the pretty wicker tray really makes them stand out. I love mercury glass. It looks so pretty when the light is reflected off it. lately i have been grouping things in some trays that I picked up at Home goods for next to nothing and I love the difference that it makes. your candles look pretty. Glitzy and pretty! Yes, I like to use groups of threes or fives. Very pretty Kelly. I love the grouping with the candle holders in the round wicker tray. Very pretty. This is very pretty, Kelly. 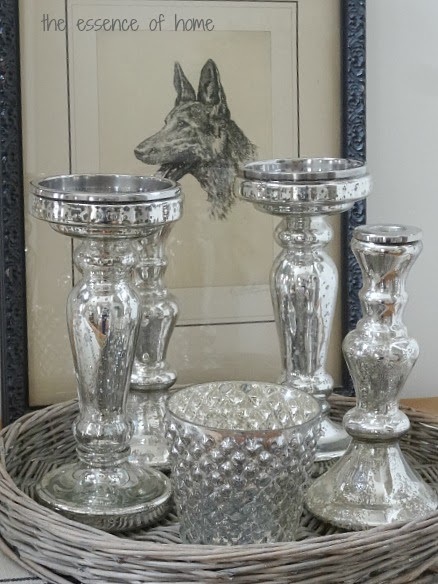 I love mercury glass (and the faux) and groupings really show things off well. This looks perfect on your cabinet! They look great grouped together. Love groupings similar items in groups of 3, 5 etc. 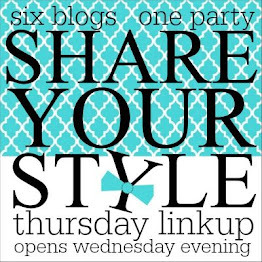 I absolutely love to do groupings of things, I think it makes a beautiful statement. 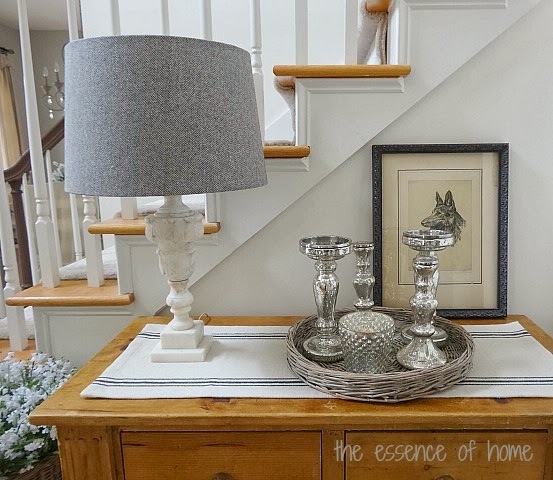 Love your candle holders AND the wicker tray. Lovely!! Kelly you should become a decorator....You are so creative! Love to decorate with candle sticks, love doing all different kinds grouped together. Yours looks so pretty and love the wicker tray you have everything sitting on! I really like your candle holder grouping, Kelly. I love things grouped on a tray or basket. It just seems to give them more of a presence than if they were grouped individually. Pretty vignette with the lamp and dog picture, too. Love your candle sticks...they look great in the basket!! I do like to use groupings of similar objects in my decorating. 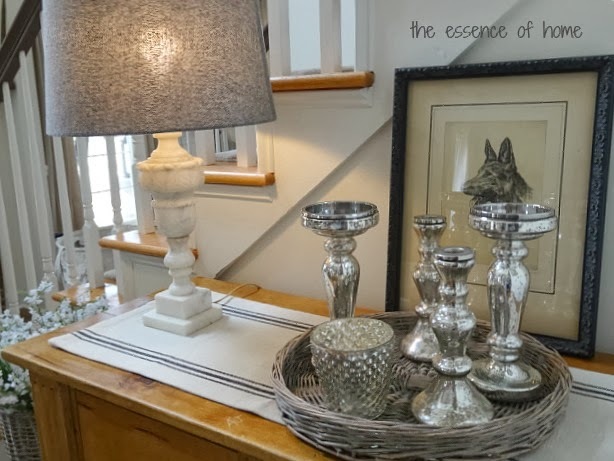 I love mercury glass candlesticks and I love grouping them together. They look so pretty, Kelly! The only thing I collect are unusual evening bags. I display them in our bedroom, but I don't go overboard. I like the idea of collecting something that I can actually use, but I so appreciate a lovely collection like yours! So pretty and stylish looking! I love the way your candle holders look. I always think groupings look much more interesting. I need to try to do it more in my house. I like grouping like things together! I have a mercury glass lamp in my bedroom (from Goodwill) and I love it! That's the only thing I have of mercury glass though. Good idea Kelly- groupings always make a great impact and putting them in a tray or basket like this is even more striking. I think we're all attracted to bright shiny objects- perhaps there's a little ADD in all of us! So pretty! I love silver, metal etc. And I love groupings. I have many! And it's fun changing them up. I get bored easily. I do love this display...and like the lamplight on the candle holders. In fact, I'd move the tray a little bit back and toward the lamp. They look nice in the basket..Love the dog sketch behind them..
Kelly, love, love this grouping. I am a HUGE mercury glass person. I splurged on a few pieces from Ballard a few years ago. Now I mainly get it from HG. I'm sure it isn't real from there but I don't care. If I love it and it is pretty I buy them. Also, love that lamp. uhhh I am just digging that little wicker tray!!!!! Love your grouping of candleholders. especially on the whitewashed tray. I have a tray I would like white wash but don't know what kind of paint to use. Guess I should google it. Are you going to Scott's this Friday? If you are and you hear your name it will be me. I am making the trip to Atlanta. Haven't been to Scott's in two or three years. Looking forward to it. Love the candle holder vignette..never thought to group them without candles...they look great!! I like the clean monochromatic looks of the whole scene. Yes, I display likes together. I have a collection of glass candlesticks that are grouped on top of a china cabinet. Hi Kelly...yes, collections are better in odd numbers. I think you shiny candle pillars look beautiful there in a basket. Kelly, I've been following your blog for a long time (came from your sister Kim) but...in silence. I love your house and I also like to know about your elder son and how happy you were when he came back home. I love displaying things together and have some collections, so I leave a link to a recent post where you can have an idea of them. Besos from Argentina (and sorry if my English is not ok, you can understand my silence...haha).